The principles of DHCP are simple and Microsoft has not changed its core since before Windows NT days, however its not something you shouldn’t undertake lightly or ill-prepared. Most of your client devices will rely on DHCP to function and failing to migrate seamlessly will only cause disruptions to your business. Every scenario will differ slightly however these steps should be useful for most migrations. In my environment I will be migrating my DHCP servers as part of a larger Domain Controller upgrade/migration project and will only document the DHCP aspect. I wont cover what already most people reading this blog know but I will advise you all to have a glance here (http://en.wikipedia.org/wiki/Dynamic_Host_Configuration_Protocol) and spend a moment refreshing your memory. There are a number on tasks to do before you start migrating DHCP. Below are the prerequisite steps I had to perform. STANDARD/OPTION 046 WINS/NBT Node Type was still configured, even though OPTION 044 was removed. This can easily be removed as its not being used. Reduce lease time on your DHCP scopes that will be migrated. This reduces risks in the event that there is a problem, because your clients will automatically renew after that point. This process alone has been documented quite heavily online so I will document the PS cmdlets only. Please refer to resources down the bottom for more detailed process with GUI installation. Note: This is only needed for a domain-joined setup. The above steps have all the details removed as the steps are fairly self explanatory. Personally I use Server Manager to install this feature as its so simple to follow the wizard. Now that you have your new DHCP service running and the server is healthy, you can go into DHCP Management Console and start preparing to migrate your DHCP scopes. The first thing I do is manually add the server predefined scope options that are required for all scopes. 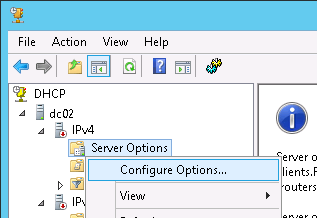 To do this, expand your server name, expand IPv4, right click on Server Options and select ‘Configure Options…’. There is also a requirement for us to add an additional scope that is not a default. To do this we need to set predefined options. To do this expand your server name, right click on IPv4 and select ‘Set Predefined Options…’. Once there, Click on ‘Add…’ and fill in the options. 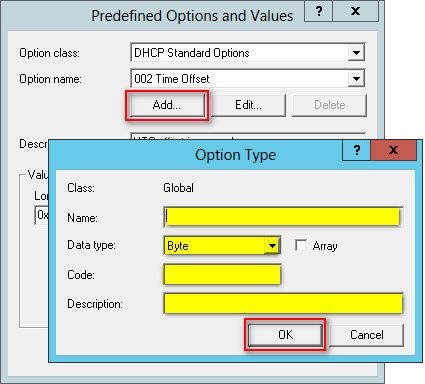 In my situation I needed to add OPTION 252 WPAD however the same steps can be used to add any Predefined Option. Click Ok to save the predefined option. Follow the same steps as above to add the new option to your Server Options. My configuration looks like the following screenshot. At this point the server is ready for me to migrate DHCP configuration from Windows 2000, 2003, 2008 and 2012 DHCP servers. I also configure the DNS dynamic update registration credentials. A DHCP server can enable dynamic updates in the DNS namespace for any one of its clients that support these updates. Scope clients can use the DNS dynamic update protocol to update their host name-to-address mapping information whenever changes occur to their DHCP-assigned address. (This mapping information is stored in zones on the DNS server.) A DHCP server can perform updates on behalf of its DHCP clients to any DNS server, but it must first supply proper credentials.These credentials are used by DHCP to dynamically update the DNS server and should be configured if the DHCP and DNS server resides on the same operating system. To do this the user must be part of either ‘Administrators’ or ‘DHCP Administrators’ group. In my environment i created a domain user account, and added membership to ‘DHCP Administrators’ group. I believe in 2003/2008 you could add the user to ‘DnsUpdateProxy’ group, however the Windows 2012 suggest using the ‘DHCP Administrators’ group. Click Start, point to Administrative Tools and then click DHCP. Click Advanced, click Credentials, type the credentials that the DHCP server supplies when registering names using DNS dynamic updates, and then click OK. I may be overly cautious however when it comes to potentially causing havoc to the business I like to test things work before affecting everyone. The initial scope I am migrating will be our VDI clients VLAN where we only have 38 currently registered IP addresses. Note: The following steps need to be made in a short span of time so read through them all before executing, and prepare yourself for it. 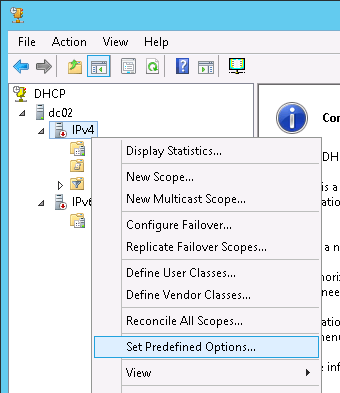 Load the DHCP MMC console, navigate to the scope, right click on it and select Deactivate. This will prevent new leases from being created. Type NETSH DHCP SERVER export dhcp-vlan7.db 192.168.7.0 and press enter. This will export all details about that VLAN to a binary file in the root of the drive. Logon to the DHCP Server you want to migrate to. Type PUSHD \\DC1\C$ and press enter. (Where DC1 is the server name that you logged onto in step 1, and C$ is the root drive that you navigated to in step 3). PUSHD/POPD is a great little trick that allows you to temporarily map a network share and assign it a drive letter. Type NETSH DHCP SERVER import dhcp-vlan7.db 192.168.7.0 and press enter. This will import all details about the VLAN into the DHCP database. Load the DHCP MMC console on the new server. You may need to refresh the console for the new scope to become visible. Once visible, navigate to the scope, right click on it and select Activate. This will allow new leases to be created on the new server. From this point you are confident in migrating the rest of your scopes from all your old DHCP servers. You can do them all in one hit, or stagger them just to be sure there are no other problems. I staged my migration as an extra precaution. The steps in the previous section explain how to do this for one scope. Below are examples that you can change for step 5 & 9, otherwise the rest can stay the same. This exports 2 scopes at the same time. You can apply the same principle to export more than two scopes. The file name ” dhcp-vlan7and8.db” can be called anything – I gave it a sensible name so I knew what to import later. This exports ALL scopes into the database. Note if you do export all the scopes, and you decide to import all scopes on the new DHCP server, you may overwrite existing scope data. This can cause inconsistencies and problems when it comes to issuing leases. This section will be coming soon in a separate post. The suggested update probably will solve the problem, but if you are planning a migraion and DHCP failover, you’d better use the migration tools and avoid this issue. Thank you for sharing this information. I was not aware of the bug and will help me when enabling DHCP Failover once I get to it. I will be able to validate whether the update does fix the issue for me. In my scenario I was not able to use the recommended PowerShell commands to extract the scopes from our Windows Server 2003 DHCP server, therefore I was forced to use the NETSH utility. Do you know with what version of PowerShell on 2003 is the Export-DhcpServer or Import-DhcpServer implemented? Just wanted mention that I tried the netsh steps on a 2012 Domain Controller and it failed. I then did the same process on a 2012 Member Server and it worked fine. I then promoted it to a DC and then it continued to function. Interesting scenario with you – I know it worked for me while it was a DC. Were you using an elevated command? I hit some problem during my co DHCP migration & hope you can advise what went wrong. Here is the background. 1. Migrated only level 3 users to the new DHCP server. 2. Deactivate the specific scope for level 3 users in the old DHCP server. Problem: All lvl 3 users are able to grab new ip from the new DHCP, while the rest of the scopes cannot. Do you have any idea where went wrong? Did you find a fix for it in the end?